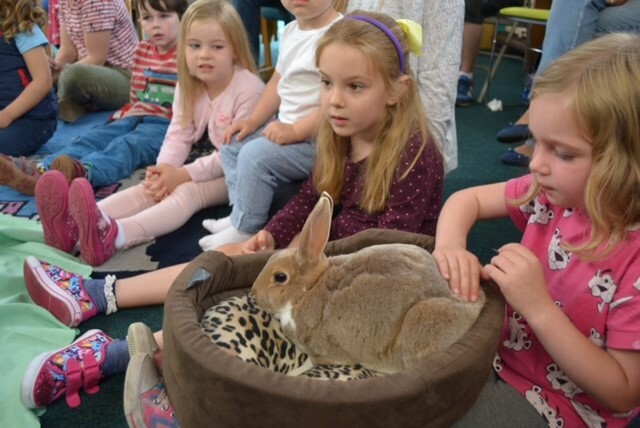 Every Friday during term time - Story & Rhyme time - 2.30pm-3pm. The activity will be determined by the ages of the children who attend. All children must be accompanied by an adult. 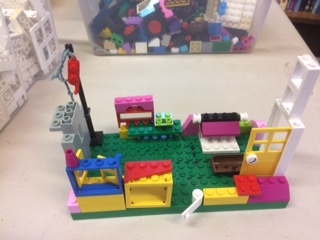 Every Saturday - LEGO Club, 10am-12noon. (We do have a good selection of DUPLO too for smaller children). All children must be accompanied by an adult. 16th April, 10am-11.30am - Sarah Morrell - 'The King and the Cockerel' - a workshop for children aged 0-9 years. 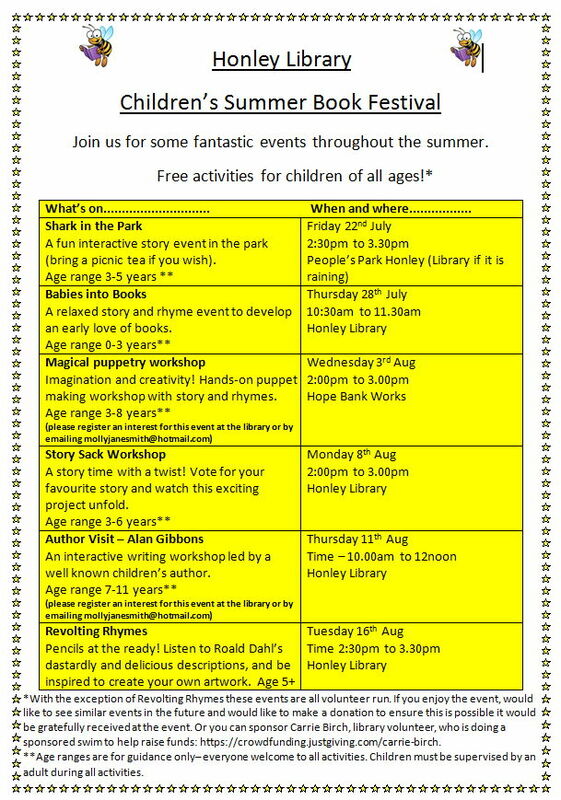 30 places available, £2 per child - you can book by visiting or phoning the library or here on our website by clicking the tab 'Children's Book Festival 2018' - Amazing local author and storyteller Sarah Morrell is coming to Honley Library with her book 'The King and the Cockerel'. 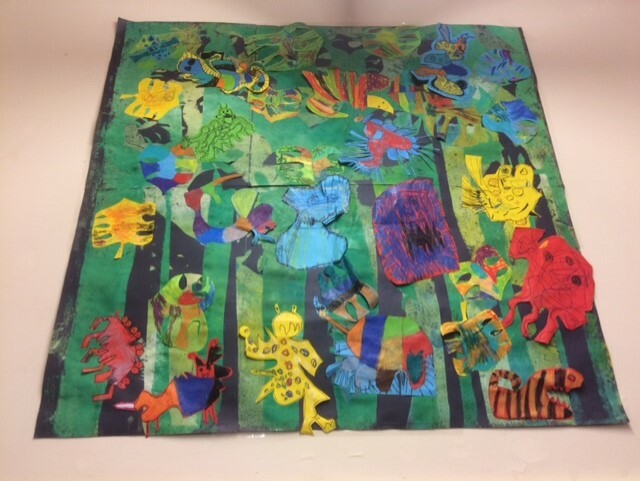 Sarah will run a workshop for children Year 2 to Year 4 in which they can develop their own pop up books and explore their creativity. Meanwhile, younger children will work with Bridget and Carrie to explore the same story. With the help of their accompanying adults, children might create their own illustration through art and craft. Sarah will read the story to the whole group, using her clever props and her fantastic story voice. To finish, there could be an Egg Hunt in the library! 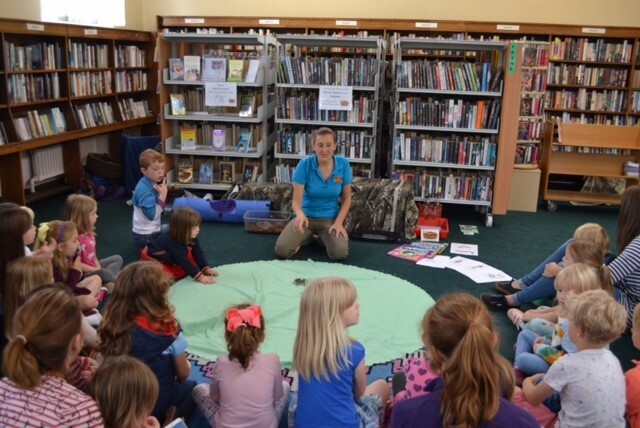 26th April, 2pm - Kirklees Library Services 'The Odd Egg Easter Family Storywalk' - A storywalk suitable for children up to 9 years - Free - This is not your ordinary Easter egg hunt - follow a winding trail through town, village and park to collect all the different eggs and see who they all belong to. Duck is very proud of her egg, but when will it hatch? Get ready for the big reveal at the end when we will read Emily Gravett's beautiful picture book, 'The Odd Egg' and meet Duck's baby! 27th April - 10am-12noon - Spring Coffee Morning - All welcome! 18th June - 7pm - Summer Poetry Readaround - Join us for an evening of poetry and prose. Bring your own poems to read, some favourites or just relax and listen. If you wish, bring a spare copy of your poems to display in our book for all to read at Honley Library. Free entry. Refreshments available. All welcome! 6th July - Strawberry afternoon tea - All welcome! 17th September - 7pm - Autumn Poetry Readaround - Join us for an evening of poetry and prose. Bring your own poems to read, some favourites or just relax and listen. If you wish, bring a spare copy of your poems to display in our book for all to read at Honley Library. Free entry. Refreshments available. All welcome! 10th December - 7pm - Winter/Christmas Poetry Readaround - Join us for an evening of festive poetry and prose. Bring your own poems to read, some favourites or just relax and listen. If you wish, bring a spare copy of your poems to display in our book for all to read at Honley Library. Free entry. Festive refreshments available. All welcome! 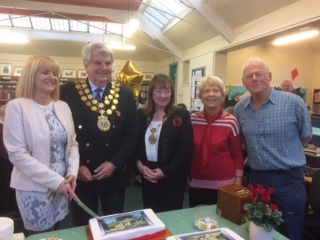 6th April, 10am - Charity Coffee Morning in aid of the Mayor's charity appeal (Kirkwood Hospice Palliative Care Team) and the Halifax, Huddersfield and District branch of the RSPCA - What a wonderful morning we had! 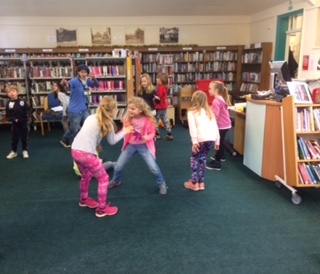 It was great to see the library buzzing and so many people enjoying the library while at the same time raising awareness and money for the Mayor's charity appeal. Thank you to everyone who joined us, baked cakes and donated raffle prizes. 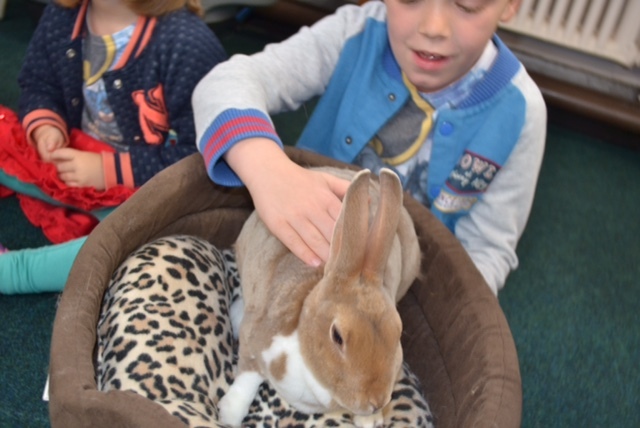 We raised a fantastic £155! Well done everyone! 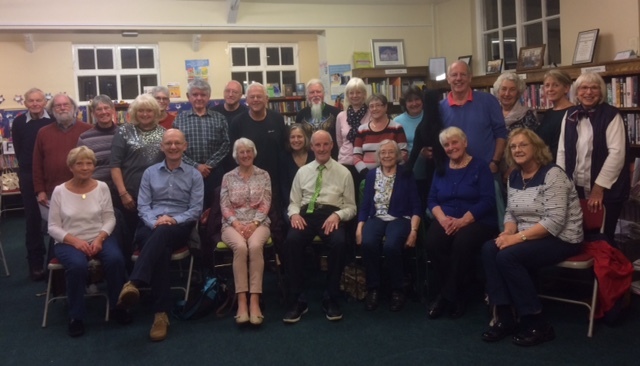 12th March, 7pm - Spring Poetry Readaround - Twenty guests from Honley and beyond enjoyed a wonderful evening of poetry and prose. Some amazing poetry was read and all agreed it had been a lovely evening of friendship and laughter. Thank you to eveyone who joined us! We look forward to our next one on18th June. 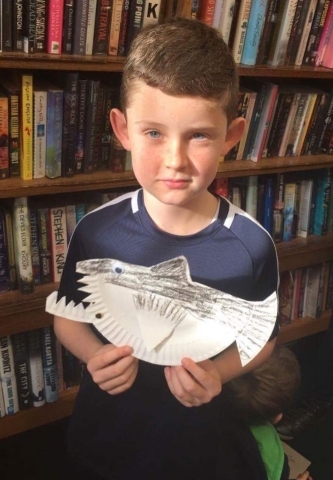 As part of Honley Library Children's Book Festival 2019. Thank you to Kirklees One Community for funding; and to sponsors, volunteers and Kirklees Library Services. 22nd February, 10am - Draw me a story with artist, illustrator and picture book creator Lisa Stubbs (Lily and Bear, Grumpy Feet). Using relief print and polystyrene tiles, Lisa led a workshop inspired by the power of stories. 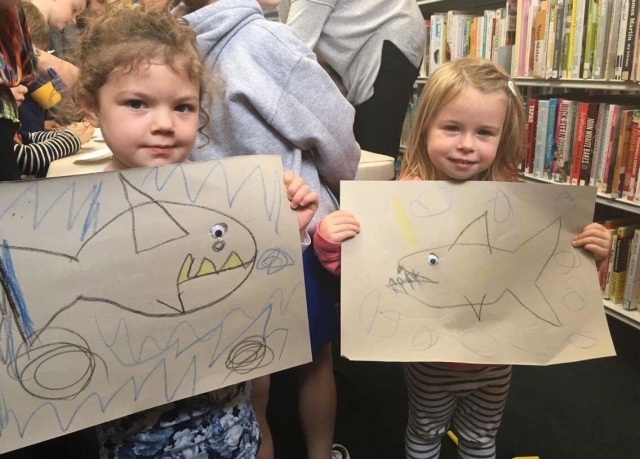 This workshop was for families with children aged 0-12 years and all found out how to create and draw the story of their own imaginary character or friend using print techniques. Thank you to Lisa for a wonderful morning. 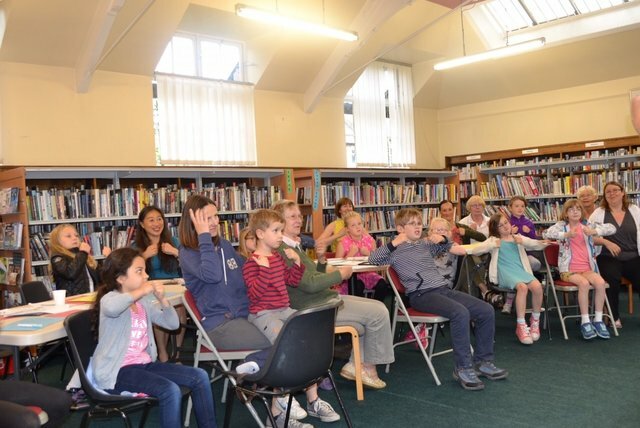 21st February - 10.30am - As part of the Pageturners Children's Reading Festival, Kirklees Library Services ran an event at Honley Library - Salma Zaman presented an interactive storytelling session followed by a lesson in amazing Bollywood dance steps. All enjoyed a wonderful morning with Salma, thank you! 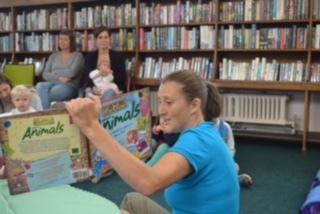 As part of our Children's Book Festival, all were invited to find out more about good books for babies. Thank you to Kirklees One Community for funding; and to sponsors, volunteers and Kirklees Library Service. 23rd January, 2pm-3pm - Babies into Books (all under 5s welcome) - all enjoyed a relaxed and fun story and practical activity session for babies, parents and grandparents and why it is important to share books with your baby in the early weeks and months of life. Reading to babies helps speech and language development. It helps your baby get a head start. The earlier babies experience picture books with you, the more they will enjoy reading and learning, and the better they will perform later at school. 30th January, 2pm-3pm - Toddlers aged 18 months to 3+ years (all under 5s welcome) - all enjoyed a fun story, play and craft session. The workshop focused on 'The Gruffalo' and there was lots of active and practical learning during the session. There was more information about lovely books available for under 5s and what makes a good book for this age group, when rapid development is taking place. 11th December 2018 - 7pm-9pm - Winter/Christmas Poetry Readaround - Twenty seven guests joined us from Honley and beyond for a festive evening of poetry and prose. We heard a wide variety of poems from humorous to thought provoking. We even had a visit from Santa! Christabel Hopesmith joined us with her story of how she launched a poetry competition, from which she published a poetry book. The competition was to mark the 70th anniversary of the NHS and poems were invited on the subject of the 'human condition'. The adjudicators were Wendy Cope - 'Making Cocoa for Kingsley Amis' and Lachlan Mackinnon - 'Small Hours'. The book is entitled 'Body and Soul' and was launched on 24th November 2018 at York Library. We were lucky to have some contributors to the book at our readaround and copies were available to buy. Also joining us was Anne Steward who has recently published a book 'Casting for Words' which features both poems and photographs and is already on its second printing. Anne is a member of the Holmfirth Writers Group. 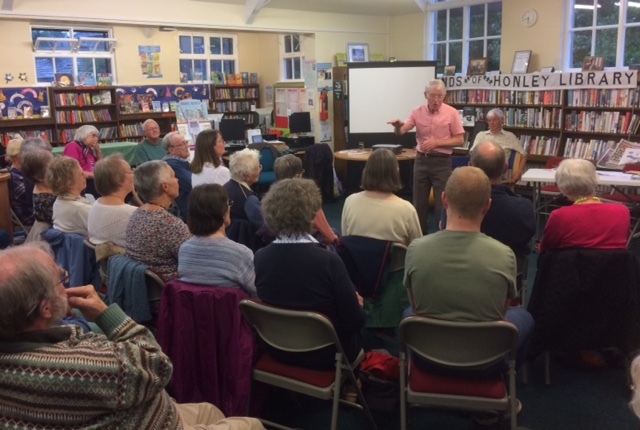 Another published author who regularly joins us, John Ling, also talked about his latest book - 'The Paper Aeroplane Man' which is a collection of entertaining short stories covering humour, pathos, mystery and tragedy. A guest joining us for the first time, Brenda, shared her own poem 'Memories of Christmas' and even handed out beautifully handwritten copies of it. Thank you to everyone who joined us and for making it a lovely evening. What a talented group! 1st December - 1pm-1-30pm - Interactive Storytime for under 5s. 1st December - 2pm-3.30pm - Interactive story and art workshop suitable for children aged 5 to 11yrs - led by artist/illustrator Rachel Johns - using 'The Jolly Postman' and magic hats to inspire creativity, Rachel showed the children how to make and illustrate their own concertina book with ink and lots of bright seasonal resources. 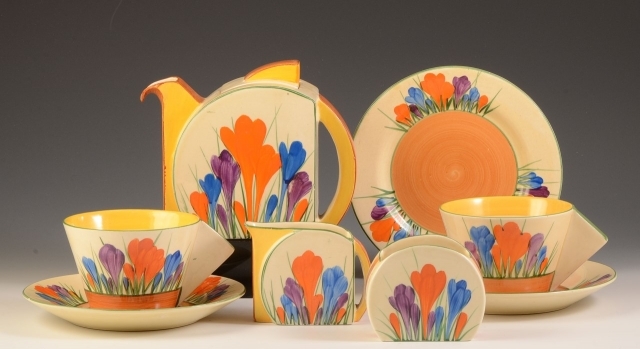 6th November, 7pm - 'The Life & Times of Clarice Cliff' - an illustrated talk by Jean Broadbent - Twenty guests joined us for a really interesting and informative evening about all things Clarice Cliff. Having been born in 1899, she died in 1972 and unfortunately did not live long enough to see just how popular her work became. Thank you to Jean for a lovely evening. 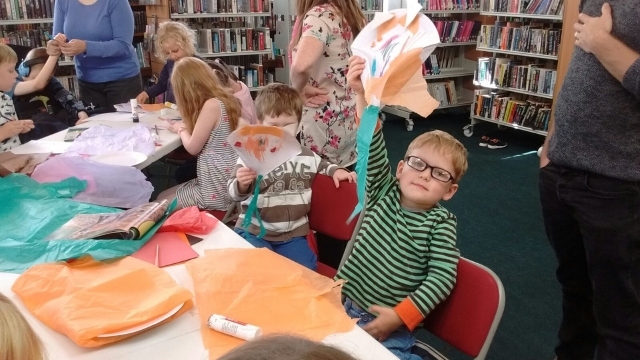 Honley Library Children's Book Festival - Autumn Half Term 2018 - All events take place at Honley Library. Thank you to Kirklees One Community for funding; and to sponsors, volunteers and Kirklees Library Service. 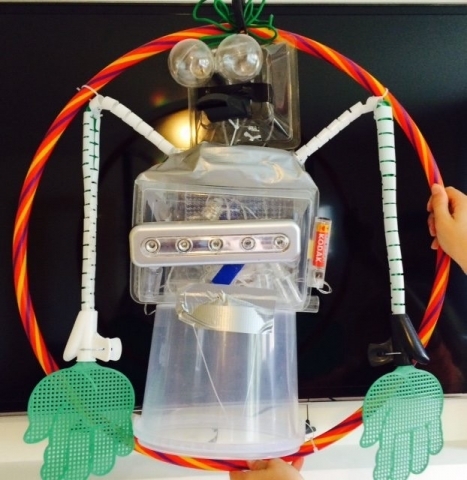 At these workshops Barry showed how to design and make mechanical robots and animals using recycled materials. The finished creations lit up! Children and their families were invited to take part in the Honley Village Parade at the Christmas Lights Switch-On. Children had a wonderful time joining Beryl to make spiders using beadwork. Thank you to Beryl for kindly donating the resources. 6th October, 10am-12noon - Macmillan Cancer Support Coffee Morning - Friends of Honley Library would like to thank everyone who supported their coffee morning in aid of Macmillan Cancer Support - we raised a fantastic £173. It was a lovely morning and great to see the library buzzing! Well done everyone! 13th October, 10am-12.30pm - Book Sale & Coffee Morning(also selling handbags, scarves and costume jewellery) - Friends of Honley Library would like to thank everyone who joined them at the Parish Rooms at St Mary's Parish Church, Honley for a lovely morning. It was a real success and we raised a brilliant £230. A huge thank you also to St Mary's Parish Church for being so helpful and accommodating in letting us use their facilities. 11th September, 7pm-9pm - Autumn Poetry Readaround - Seventeen guests joined us for a friendly and informal evening of poetry and prose. We heard some wonderful poetry from poets ranging from Wordsworth, Yeats, Patience Strong to Spike Milligan. Some guests read their own amazing poems which were emotive, beautiful, humorous and heartbreaking. Themes ranged from Autumn itself to Cycling, Beaches, Seasons of the Colne Valley, Starlight Nights, Bereavement, Flamingos and Philosophy! Copies of some of these poems are now available to read in our dedicated book at Honley Library. It's well worth a read! Guests enjoyed refreshments during the interval and all agreed it had been a most enjoyable evening. Thank you to everyone who joined us. We look forward to our next one on 11th December. All welcome! The theme of our 2018 Children's Book Festival is 'Mischief'. Unless stated, all events are offered free but donations of 50p per child place go back into the pot towards resources and materials! Thank you to all our amazing sponsors, volunteers and Kirklees Library Service. 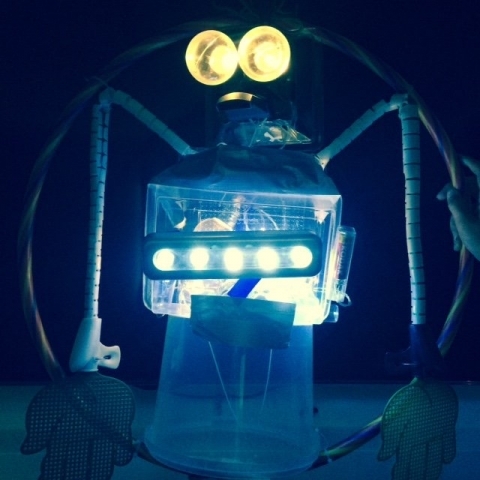 31st August, 10.30am-12noon - Making a Robot Workshop with local artist, Barry Russell - twenty children aged 5+ years (and enthusiastic parents) joined Barry as he showed them how to design and make mechanical robots that light up! Recycled materials were used and children got to take home a robot and made something extra to be part of the Honley Village Parade in November. Some amazing robots were created. A huge thank you to Madam Mayor who was able to join us. Well done everyone - you were all winners! 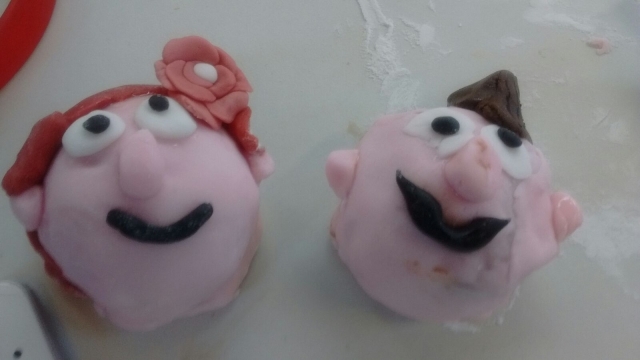 21st August, 10.30am-12noon - Cake Decorating Workshop: Comic Cartoon Characters - young people aged 9+ years joined Bridget's workshop making mischievous faces out of chocolate, marshmallows and fondant icing. 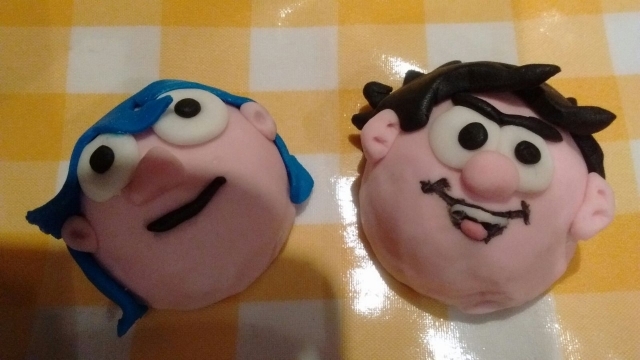 Characters were inspired by Dennis the Menace and Hilda Nobrow. 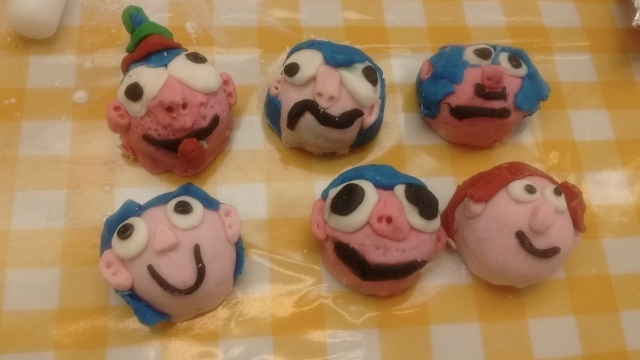 Everyone made at least two faces to take home and they look delicious! 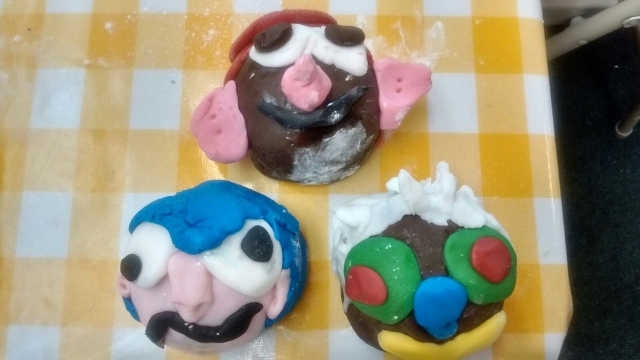 Some fabulous creations made, well done everyone. 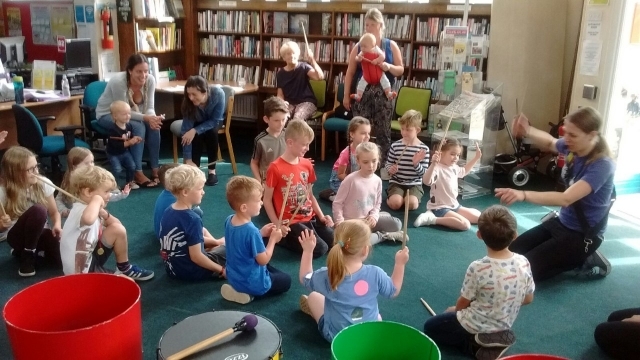 16th August, 10.30am - 12noon - Honley Samba Band - children aged 5+ years enjoyed the return of Honley Samba Band to Honley Library with a mischievous workshop. Looks like everyone had great fun! 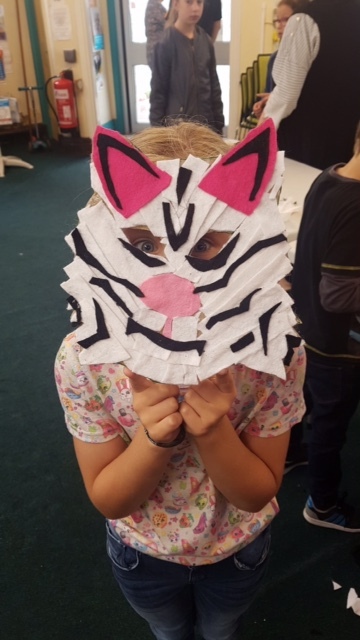 10th August, 10.30am - 12 noon - 'Mischievous Mr Fox' - craft workshop led by Emily - children aged 3-8 years enjoyed getting crafty with a focus on 'Fantastic Mr Fox', making masks and designing a selfie 'WANTED' poster! Great job everyone! 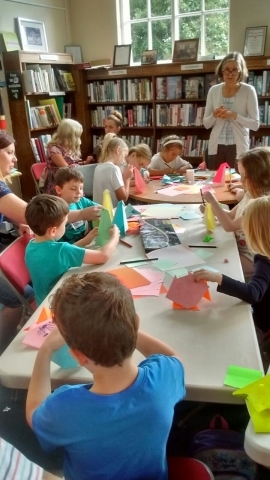 9th August, 10.30am - 12 noon - Origami workshop with Fiona - children aged 8+ years were amazed at what mischief a piece of paper can get up to after one, two or more folds. They were able to make their own origami animal then illustrated mischievous adventures they got up to! 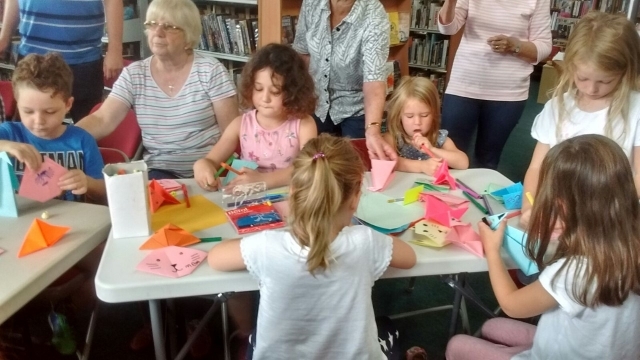 30th July, 10.30-am - 12 noon - Origami workshop with Fiona - children aged 4-7 years were amazed at what mischief a piece of paper can get up to after one, two or more folds. They were able to make their own origami animal then illustrated mischievous adventures they got up to! Some children then read out their stories to the whole group. Fantastic workshop by Fiona, well done everyone! 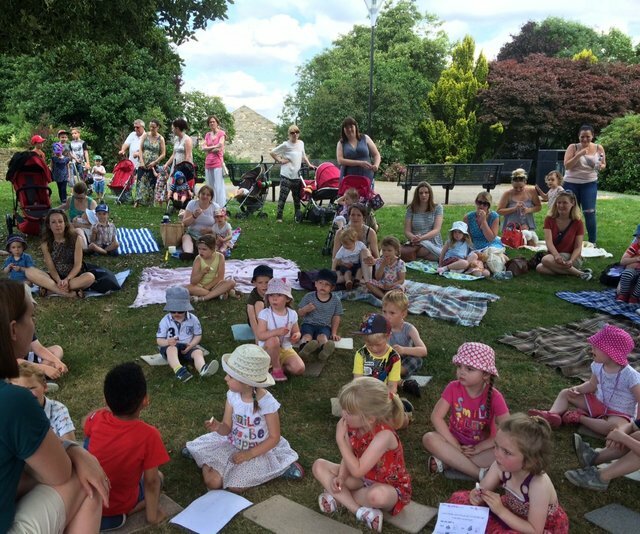 27th July - Cartoon Capers Storywalk for the whole family - Kirklees Library Service, along with children dressed as superheroes, headed off from Honley Library to explore the outdoors in a cartoon character themed Storywalk. 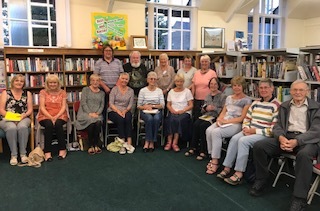 12th June, 7pm-9pm - Summer Poetry Readaround - Eighteen guests enjoyed an informal and relaxed evening reading their own poems and some favourites. We had a wonderful array of poems; heartfelt, moving and thought-provoking from the talented people of Honley and beyond. Some poems were themed around Summer but others ranged from Adolescence, Childhood Eyes, Travelling Light, Gathering the Turf, Walking and Packing! Favourite poets included W.H. Davies, Robert Service and U A Fanthorpe. During the interval, guests were able to enjoy refreshments. All agreed it had been a lovely evening and are looking forward to our Autumn Readaround on September 11th. 12th April, 11am-12noon - As part of the Pageturners Children's Reading Festival, Bali Rai visited Honley Library. Bali is a well established, award winning author and a hugely popular voice within the young adult fiction market. This was suitable for children aged 8+years. 14th April, 2pm - 'The Lazy Historian' - local historian, Peter Marshall, member of Honley Civic Society entertained 24 guests, telling us how he came to write books, from railway histories to the local history of Honley, as well as the design and printing of each book and the how they come together. Peter, son of a journalist, hails from Dundee where he was educated at Harris Academy and St Andrews University, graduating with an MA in Economics and Geography in 1968. After retiring from a career in retailing, Peter turned his interests to local history, in particular that of Honley, to research and write about, but this was not his first foray into writing. A lifelong enthusiasm for Scottish Railways prompted him to find out more about the early companies in his native heath back in Victorian times and resulted in four substantial works published in the late 1990s and early 2000s. However, it is for Honley's history that we know him best and over the years he has written and produced many pocket sized books about the village. 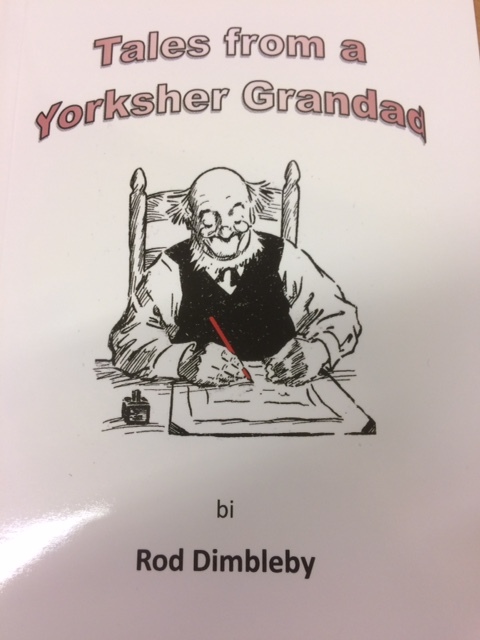 He has also produced books from other authors, all for the benefit of Honley Civic Society. Along the way he has learned some of the skills in publishing and this enables each book to be an entirely Honley production! Some of these books are available to read at Honley Library and can be found in the 'Local History' section. Guests were able to buy signed copies of Peter's books. Everyone agreed it had been a lovely afternoon. Thank you Peter! 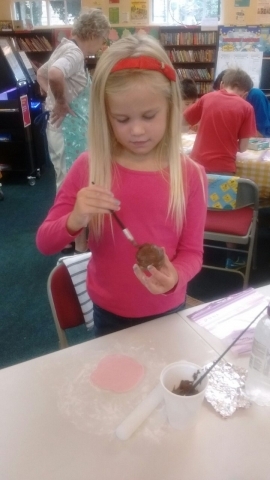 9th April, 2.30pm-3.30pm - Eggs-extravaganza - Fifteen children enjoyed a lovely egg themed afternoon with Bridget, one of our volunteers. Children painted eggs to take home and made yummy chocolate nests which they either ate straightaway or took home! There was also a great 'falling egg' competition, stories, puzzles and word searches. Everyone agreed it had been a great afternoon and thanks to Bridget for organising. 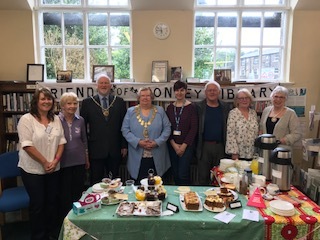 7th April, 10am-12noon - Charity Coffee Morning in aid of the Mayor's Charity Appeal - Alzheimers Society & Dementia UK - Friends of Honley Library hosted a charity coffee morning in aid of the Mayor's Charity Appeal - Alzheimers Society & Dementia UK. It was great to see so many people enjoying the library at the same time as raising funds and awareness for the Mayor's Charity Appeal. 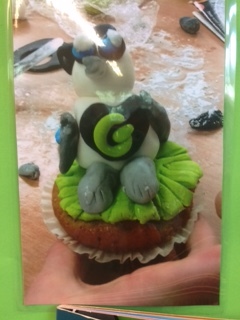 Thank you to those who donated raffle prizes, Care Collection who donated cakes and everyone who had baked. We raised a fantastic £133. Thank you to everyone who attended and made it such a special morning. 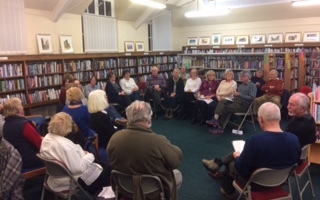 13th March, 7pm-9pm - 'Spring into Poetry' - We enjoyed a wonderful evening of poetry with guests reading their own poetry and some favourites. The poems were moving, thought-provoking and some were downright hilarious thanks to Tony! There are certainly some talented people from Honley and beyond. Some of the poetry was themed around Spring but others ranged from Shopping, Purification, Lists, Strikes and Heart Attacks! Some of the favourite poets we heard included Robert Brown, Wendell Berry, Tennyson and Philip Larkin. Guests enjoyed refreshments and the now famous 'Friends' homemade cakes. All agreed it had been a super night filled with laughter and friendship and we look forward to our next one in June. Some guests brought copies of their poems for us to display in the library in a book we are creating for all to enjoy at Honley Library. 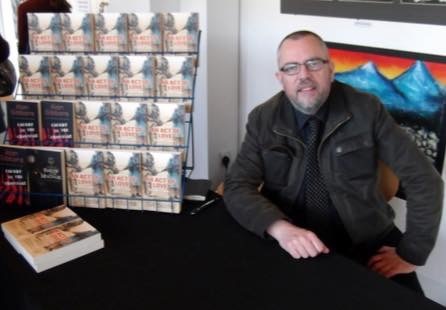 30th January, 7pm - Meet local author, Chris Longden - We enjoyed a lovely evening with the inspirational Chris Longden, who writes both fiction and non-fiction. 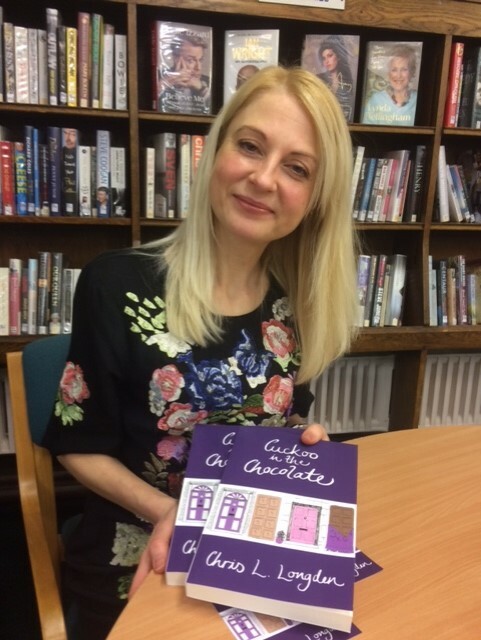 Her style is 'comedy-drama' and she presented her latest novel 'Cuckoo in the Chocolate' which is set here in our very own Holme Valley. It was amazing to hear her story and how passionate she is about books, writing and libraries, Chris had us all enthralled. 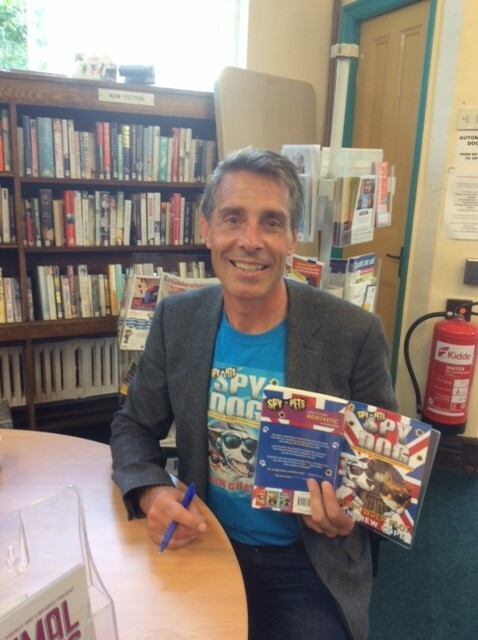 Chris is also a champion of libraries and works with Kirklees Libraries to bring in reluctant readers and to make the best use of our resources. Chris has donated 20 copies of her books to the Kirklees Libraries ebook and audiobook collection. Chris prefers 'real books' herself, but also wanted to use the event to show participants how to use Kirklees Libraries ebook service. Kevin John ,of Kirklees Libraries, also came along and helped us access the collection as well as the new PressReader digital magazine and newspaper resource (although we did have problems with the library wi-fi!!) If you are interested in ebooks, download the 'OverDrive' app onto your device and start reading - you will need your library card and PIN number to get started. If you don't know your PIN number, please contact the library. 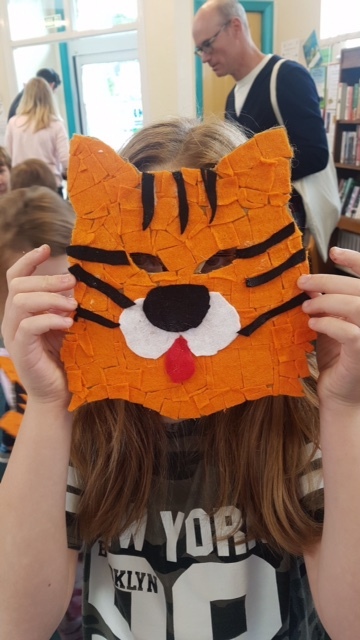 4th January 2018 at Honley Library - A Tiger's Tale interactive drama workshops - As part of Honley Library Children's Literature Festival, Lawrence Batley Theatre Company ran interactive drama workshops for children themed on 'A Tiger's Tale' based on the story of Fenella the Holmfirth Tiger! The workshops introduced children to theatre production. Children had fun developing their theatre skills to interpret the story. It was great to see everyone working together and putting on a performance at the end. Two workshops were held throughout the day, 10am-12noon for children aged 4-7years and 1pm-3pm for children aged 8-11years. Thanks to everyone who came and to Sohail and Siobhan for making it such a fun day! 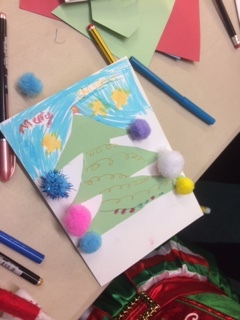 18th December, 1pm-3pm - Christmas SCRAPtastic workshops - to celebrate the launch of SCRAPtastic; the book; fairandfunky ran a Free Christmas SCRAPtastic workshop at Honley Library. 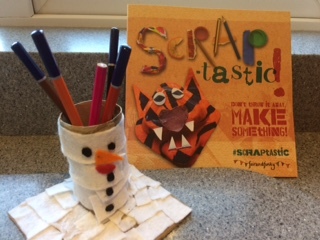 SCRAPtastic workshops use recycled materials to create individual works of art. 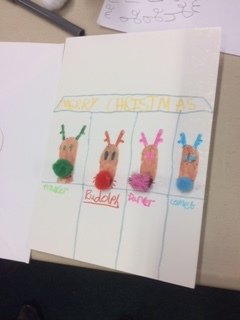 Children had fun creating Christmas Pen Pot Pals. The SCRAPtastic book was also available to buy! 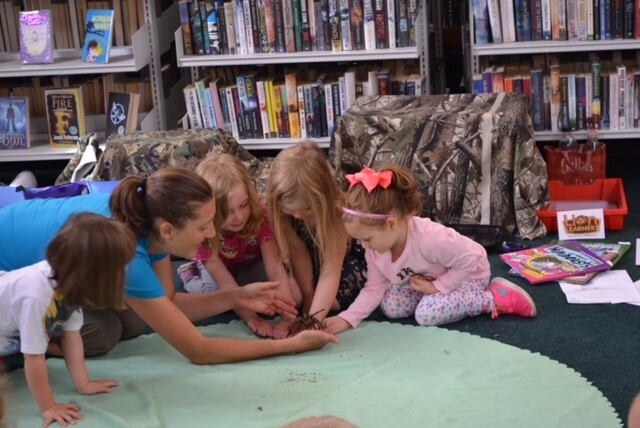 This event was open to families of all ages. 5th December, 7pm-9pm - Christmas Poetry Readaround with Christmas/Literary Quiz - Seventeen guests from Honley and beyond joined us for an evening of poetry and prose themed around Christmas and winter. Guests read their own poems and some favourites. We had a wonderful array of poems from the deeply moving to the humorous. We then enjoyed some festive refreshments and all took part in our quiz. Well done to Trevor for winning the quiz - Trevor had come all the way from Bradford to join us! Thank you to everyone who came and made it a lovely evening. 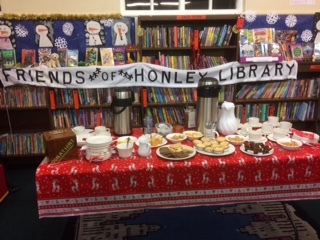 5th December, 6pm-7pm - Friends of Honley Library hosted a small thank you get together for all those who had generously supported the library in refurbishing the workroom and toilet. We would like to say a huge thank you to: The Huddersfield Common Good Trust, Felix Eaton and the staff of Replan UK Limited, Atlas Bathrooms, Al-Murad tiles, P Morris Plumber, Neil Schofield and Lawrence Jones. 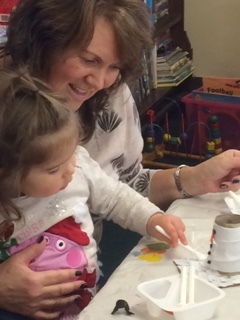 2nd December - Christmas at Honley Library - We had a wonderful day at the library. 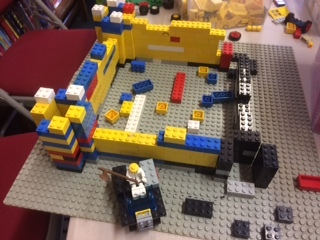 We started the day off with our LEGO Club which saw lots of children creating brilliant pieces of work. 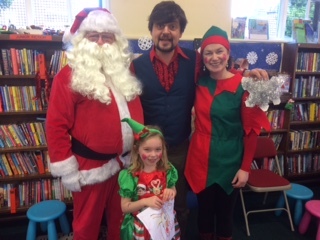 At 1pm we had a special festive storytime with David and the childlren were so absorbed in the story that they didin't notice our special visitor - Father Christmas! We also had two special elves 'Christmas' and 'Frosty' - Santa's little helpers! 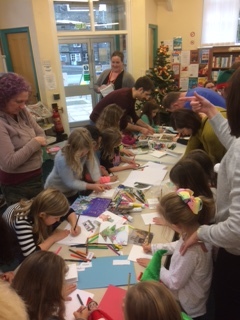 At 2pm we had a workshop with Ali O'Neill, a professional illustrator, and children made their own Christmas cards. 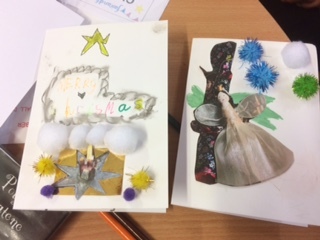 We had some super cards made and the children showed amazing imaginations. Our Pop Up Cafe was also running all day. It was great to see so many people in the library, thanks to everyone who came and made it such a special day. 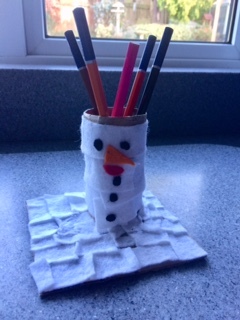 10th November, 3.30pm-4.30pm - Winter Craft Activity with Emily - We were joined by 20 local children for an after school craft activity. 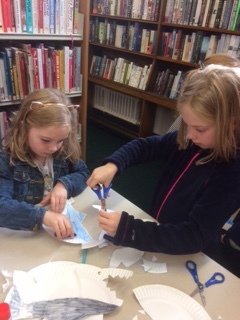 We made winter themed decorations to use to decorate the library. Everyone had fun and the works look super up on display in the library! 11th November, 2pm-3pm - Glass painting lanterns with Bridget - suitable for children aged 6-10yrs. 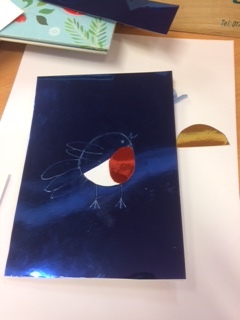 Bridget was joined by 17 children who designed and decorated glass lanterns ready for Honley Christmas Lights Parade on 18th November at 6pm in the People's Park. The children also decorated a tea light to give as a Christmas present or keep for themselves! 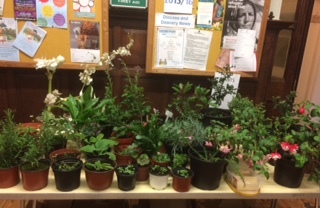 28th October, 10am-12.30pm - Book, Cake & Plant Sale & Coffee Morning - held at St Mary's Church Parish Rooms - Thank you to everyone who supported us at this event. It was great to see so many people. 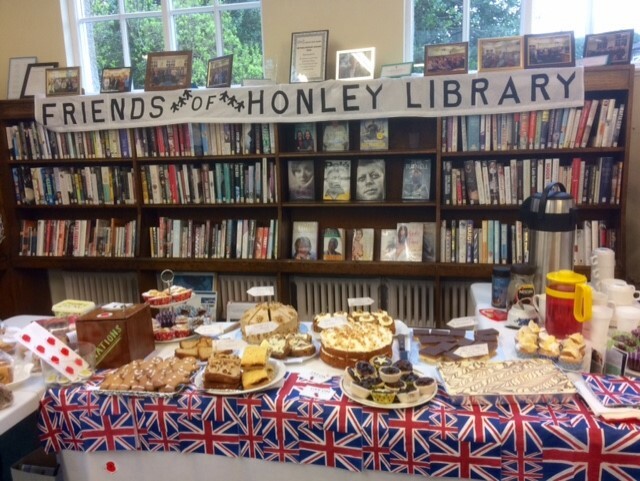 It was a lovely morning and we raised a brilliant £300 to support Honley Library events. The residue of books have gone to support Kirkwood Hospice, an overseas charity and our Parish Church. 25th October, 11am - 'Shark in the Dark' Storytime - Twenty children joined Helen Harrison for a fun and interactive storytime with Nick Sharratt's new book 'Shark in the Dark'. Afterwards they enjoyed singing, games and craft activities. The children produced some super creative artwork and scary sharks! Well done everyone! We even got a reply on Twitter from Nick Sharratt himself - "Wow! It looks like you had a brilliant time. I'm impressed at all the ways you found to make scary sharks." 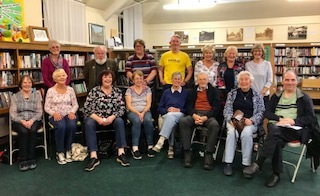 10th October, 7pm-9pm - Autumn Poetry Readaround - Twenty eight guests from Honley and beyond joined us at our Autumn Poetry Readaround. There was also a special 'guest' - Ebony, the mascot for the Black Horse Poets of Wakefield. Guests read their own pieces of poetry, as well as some favourites. 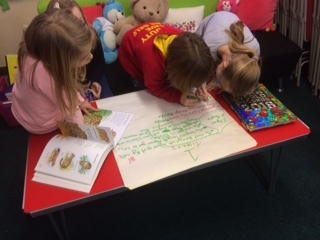 There was a wide range of poetry from Autumn to spiders to duvets and Jane Austen to Thomas Hardy, which were funny, moving and thought provoking. We even had a poem on the 'Magic of Magdale'. One guest sang the poems of John Clare to his own musical composition on guitar, which was extremely haunting yet beautiful. Guests also enjoyed refreshments and the now famous 'Friends' delicious home made cakes! Thank you to everyone who attended and for making it a very special evening. 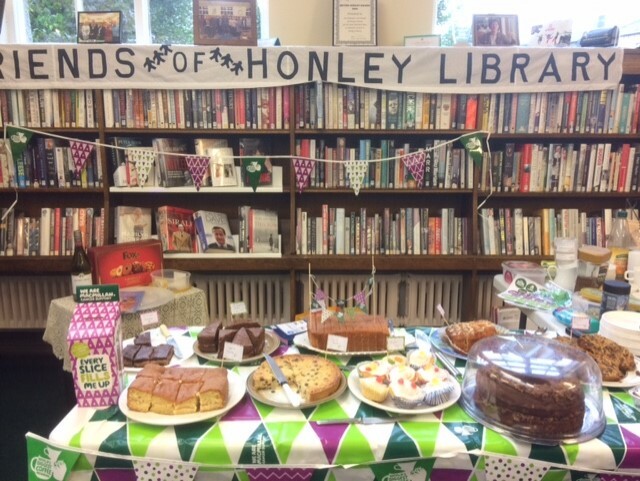 7th October, 10am-12noon - Macmillan Coffee Morning - Friends of Honley Library would like to thank everyone who supported them at a very successful coffee morning in aid of Macmillan Cancer Support. It was a lovely morning and great to see so many people in the library, enjoying one another's company and the delicious home made cakes, whilst making a difference. We raised a fantastic £190. Well done everyone! Kirklees Libraries held its annual volunteer awards on 4th October at Huddersfield Library. This is the chance for us all to get together and celebrate the fabulous work all of our volunteers do to support our libraries, and to recognise the special contributions of our award winners. Amongst the categories was the Community Award which celebrates those who support us to deliver vibrant and engaging activities that help make sure our libraries stay at the heart of the community. 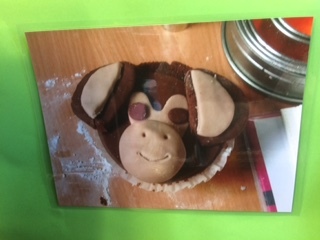 It was one of the most competitive categories, she was up against some impressive competition, and was won by Carrie Birch from Honley Library. 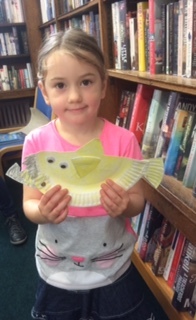 Carrie Birch is the Volunteer Co-ordinator at Honley Library and we are in awe of her passion for libraries. Under her leadership we have increased the number of volunteers, made huge strides in working together with FoHL and run a successful Children's Literature Festival. Fundraising has been a strength, with a sponsored swim and the successful securement of three grants to enable children's events for 2 years. 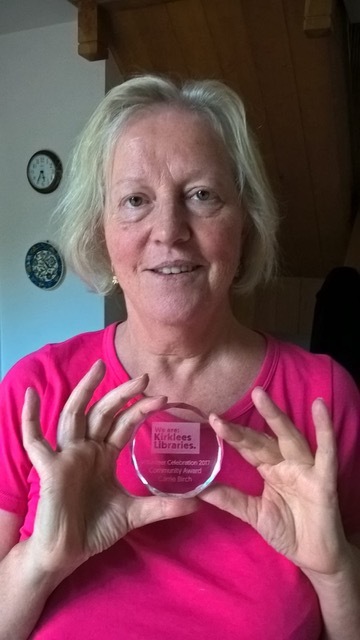 She has contributed immensely to the future of Honley Library by recruiting volunteers and supporting the management structure for the library as well as volunteering in the library herself. Carrie's commitment to Honley Library is exemplary - cut her in half and she'd have Honley Library through the middle, like Blackpool Rock! Congratulations Carrie! Carrie believes that volunteering at the library works best for volunteers when they feel that they are getting back personal satisfaction. Photograph below - Carrie with her award. 12th September, 7.30pm-9pm - An evening with Jo Haslam, acclaimed widely published prize-winning poet. Jo is the winner of 2012 Mslexia Competition, prize winner in the National Poetry Competition 2010 & 2015 and recipient of a Straid award for 'On the Kiso Road'. Throughout September the library service focused on their Business offer, aiming to ensure customers and community know what support they can offer businesses or business ideas. Members of the public were invited to come along to a drop in session at Honley Library between 1.30pm & 4.30pm on 15th September to see what free support is on offer. 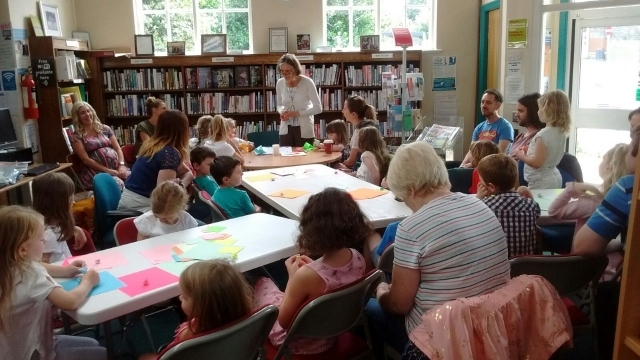 Lots of other business events were happening at other Kirklees Libraries. 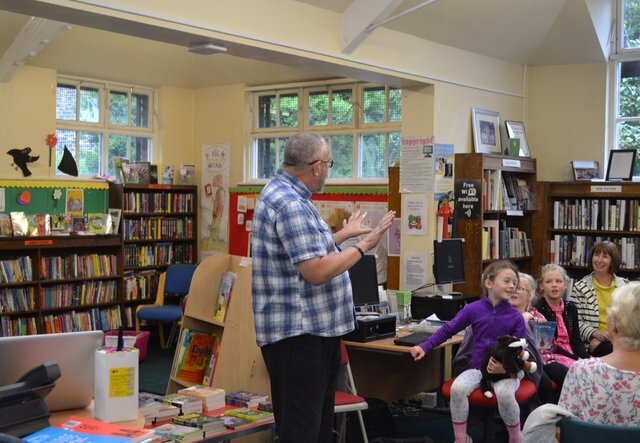 Honley Library Children's Literature Festival 2017 - This was made possible with grants from Holme Valley Parish Council and the Kirklees Rural District Committee. Also by the volunteers and Friends of Honley Library. 31st August, 1.30pm-2.30pm - Origami Workshop - A chance for everyone to get creative and learn about the Japanese art of paper folding. What is hidden in a sheet of paper? Birds, little fish and other animals were hiding in there! This was for children aged 7-11years. 29th August, 10.30am-11.30am - Origami Workshop - A chance for everyone to get creative and learn about the Japanese art of paper folding. What is hidden in a sheet of paper? Birds, little fish and other animals were hiding in there! This was for children aged 4-7years. 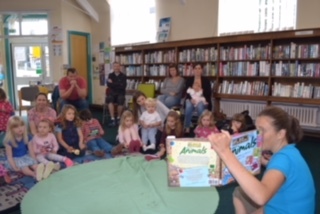 25th August, 10.30am-11.30am - Poetry and Percussion - Katie from Honley Samba Band returned to the library bringing poetry alive with funky beats. 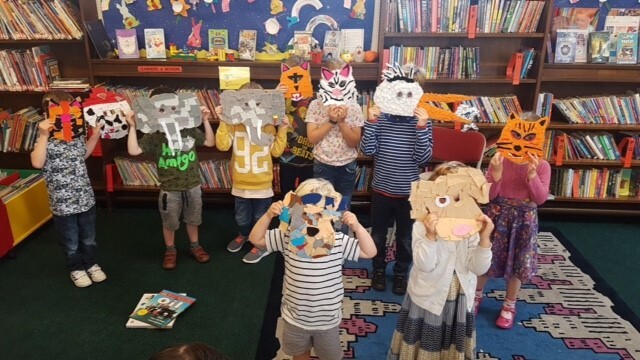 Children had fun making a noise in the library by composing their own funky rhythms to the words of Roald Dahl's 'Gruesome Tales of Wild Animals - Dirty Beasts!'. This was an inclusive event open to all but most suited to 7-11 year olds. 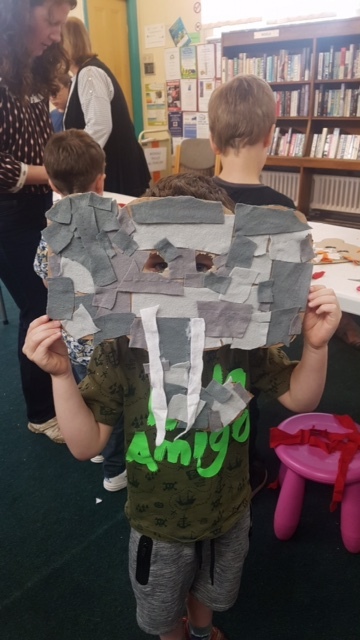 21st August, 10am-11.30am - Fair and Funky came to Honley Library - an art, craft and drama workshop about endangered animal species, using John Burningham's story 'Oi! Get off our Train'. The morning included story reading, drama, mask making and other crafts using recycled materials. Children found out how endangered species work to save each other! This was an inclusive event open to all but most suited to 3-12 year olds. 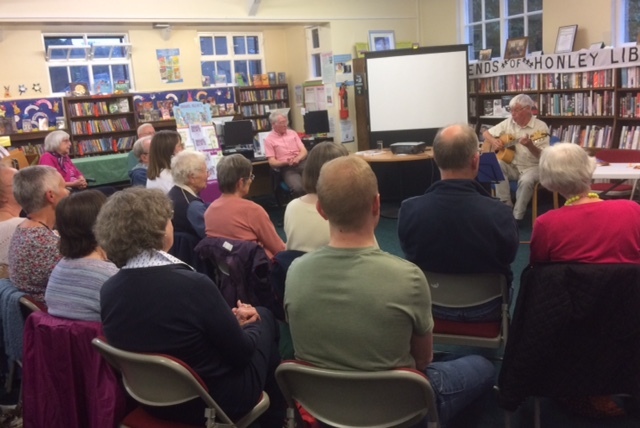 A packed Honley Library was full of laughter and song when over thirty people enjoyed a lovely evening celebrating Yorkshireness in song and story with Rod Dimbleby (local author and storyteller) and Eddie Lawler (locally known as the 'Bard of Saltaire'). Rod told us traditional Yorkshire tales spoken in Yorkshire dialect. Eddie sang some of his own written songs with wide ranging themes from Harry Ramsdens to the Brontes, as well as a 300 year old ballad about Leeds, we even got to join in with the singing! Guests enjoyed the now famous 'Friends' homemade cakes and were able to buy copies of Rod's books and Eddie's CDs. Everyone agreed it had been a thoroughly enjoyable evening. 9th June, 2.20pm - A special sensory storytime with Goldilocks and the Three Bears told by Bridget Crabtree and Helen Harrison. 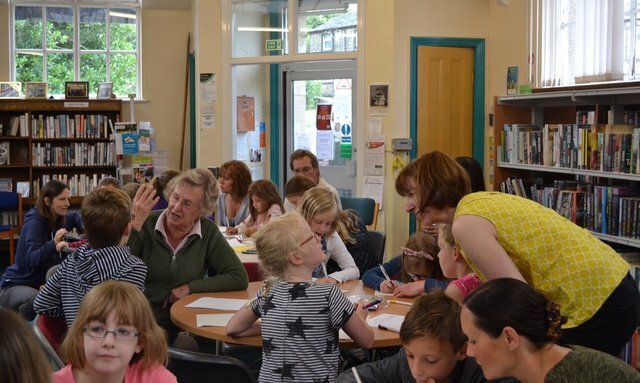 Friends of Honley Library hosted their Poetry Readaround and the evening was well attended. Guests read their own pieces of poetry, as well as some favourites. There was a wide range of poetry which was funny, moving and thought provoking. One guest sang the poems of John Clare and Thomas Hardy to his own musical composition on guitar, which was extremely haunting yet beautiful. Guests also enjoyed refreshments with the now famous 'Friends' delicious home made cakes. Thank you to everyone who attended and for making it a very special evening. 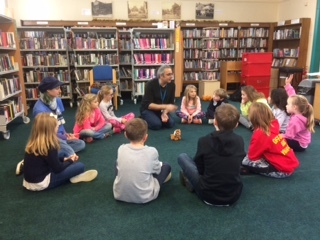 18th April, 10.30am-11.30am - As part of the Pageturners Children's Reading Festival - Children enjoyed a morning listening to Stories from the Punjab and Beyond with author Peter Chand. Peter shared his stories from Singapore to Southall, Dublin to Delhi, Canada to Cardiff and many a place in between. 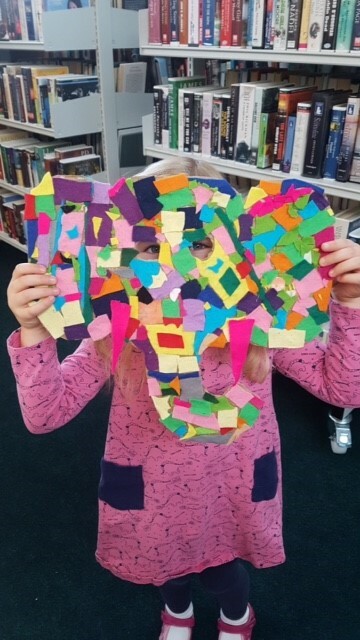 21st April, 10am-12noon - As part of the Pageturners Children's Reading Festival - Children enjoyed a creative art workshop with The Children's Art School, working together on large scale artworks to be displayed in the libraries. They also created their very own masks to take home. Visitors enjoyed an evening of poetry themed around 'Inspiration & Imagination'. Unfortunately due to unforeseen circumstances Doris Corti was unable to attend the event. 'The Friday Poets' read a selection of their own poems as well as some of Doris's prize winning poems. 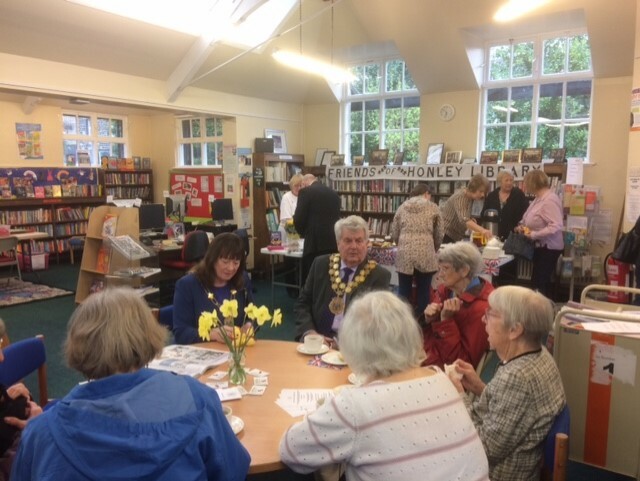 Friends of Honley Library would like to thank everyone who attended their charity coffee morning in aid of the Mayor's charity, The Royal British Legion. Visitors enjoyed an informal morning of coffee, cake and conversation. There was a raffle and delicious home made cakes for sale. 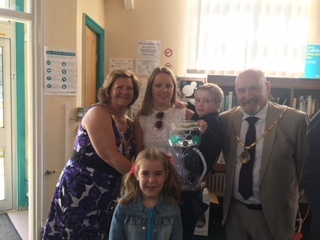 A big thank you as well to Rita from the Honley Library Knit and Natter Group who had knitted Easter chicks complete with easter egg and sold them on the morning with all proceeds also going to The Royal British Legion. The morning was a great success and raised a total of £170. Thank you to everyone who made it a very special morning. Over 30 people enjoyed a wonderful evening of poetry and prose. Guests read their own poems as well as some favourites. There was a variety of Spring poems which made us feel as though Spring was on its way! Some guests read their own poems of betrayal and loss which were extremely moving. There was even an ode to Emily Bronte! We also heard a poem entitled 'Lifeboat' by Anne Broadbent who was a finalist in the Huddersfield Literature Festival 'Courage Is' Poetry Competition. Thank you to everyone who attended and for making it such an inspiring evening. 23rd February - 3.30pm - Mardi Gras came to Honley Library! 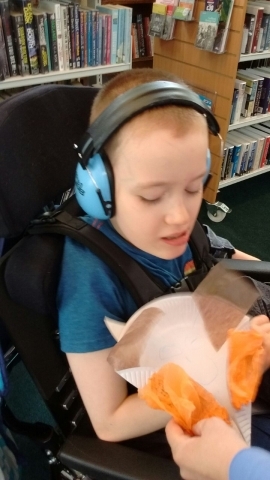 We all had great fun and enjoyed some sensory story telling, mask making and a mini samba workshop. Monday 5th December, 7pm-9pm - Christmas Poetry Readaround with guests Honley Male Voice Choir's '8 in a Bar'. 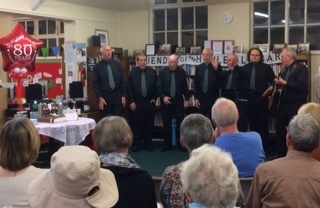 A packed Honley Library was treated to a special performance from Honley Male Voice Choir's '8 in a Bar'. Songs performed included Simon and Garfunkel's Scarborough Fair, Everly Brothers Bye Bye Love, All I have to do is Dream and a Beatles medley, in addition to the '8 in a Bar' classics The Rose, The Gambler and Unchained Melody, finishing with Christmas Carols. This year '8 in a Bar' were invited to perform in Oswestry on the borders of Wales at the opening of an Events and Function Suite named 'Carriages', which was extremely well received. The 'Friends' presented '8 in a Bar' with a donation for Honley Male Voice Choir. The audience read Christmas and winter themed poetry, as well as some favourites. 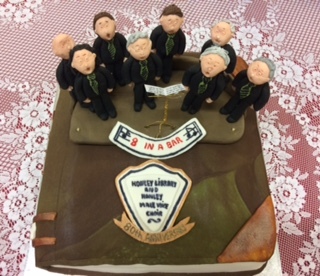 Guests also enjoyed festive refreshments and a special cake, made by Ruth Colquhoun of Mirfield, to celebrate the 80 years anniversary of Honley Library and Honley Male Voice Choir. Guests were able to buy copies of the Honley Male Voice Choir CD - Voices in Harmony - celebrating their 80 years. 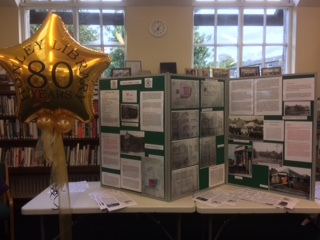 Also on view for the evening was the display showing the history of Honley Library throughout its 80 years, created by some of the 'Friends' which was unveiled by the Mayor and Mayoress of Kirklees at a recent celebration. 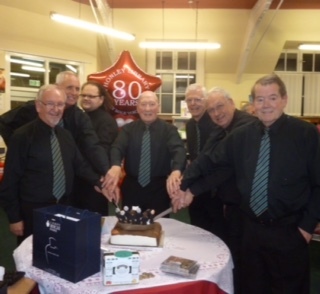 In addition to providing entertainment at lots of local events, Honley Male Voice Choir marked their 80th Anniversary with a visit to Llandudno, North Wales, where the full choir gave a performance to an appreciative audience at St John's Methodist Church, where a local harpist accompanied them. Two weeks later they performed to a full house at the Poulton-le-Fylde Methodist Church, Lancashire, where they last sang 30 years ago. 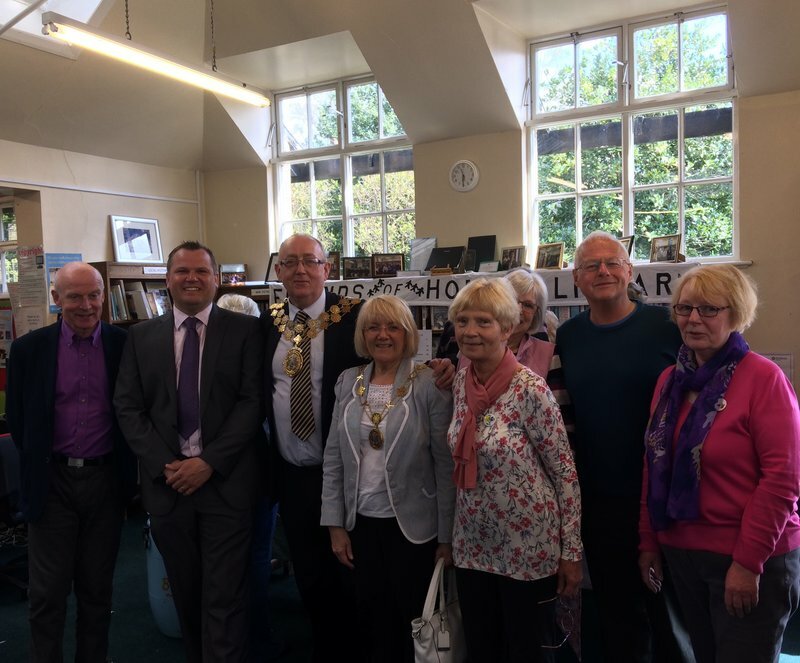 Friends of Honley Library celebrated Honley Library's 80th Anniversary and were proud to have the Mayor and Mayoress of Kirklees unveil a new display, created by Caroline Page, Joe Hodgson and Steve Dufton, which shows the history of the Library throughout its 80 years. We were joined by guests from Kirklees Library Services, Honley Village Trust, Honley Civic Society, Honley Business Association, St Mary's Church, Trinity Church, Historians from the Local History Society, our local Councillor and local residents and users of the library, one of whom, Mrs Kathleen Dyson, remembered the Library being built. 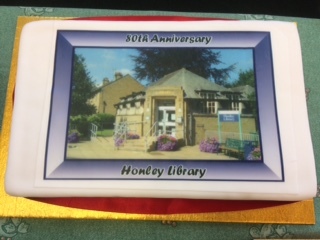 There was a special cake commemorating the event, which was cut by Carol Stump, Chief Librarian Kirklees Council, which everyone enjoyed with refreshments whilst reading the display and sharing their own memories of Honley Library. Here's to the next 80 years! 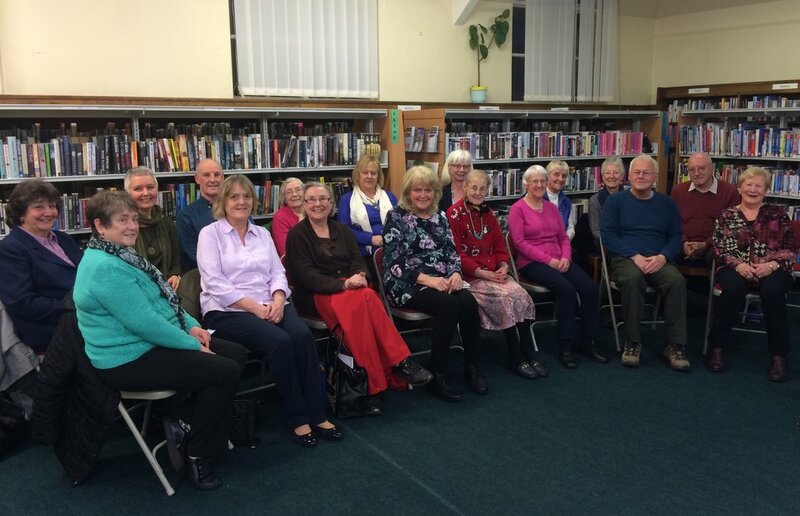 - The first Library in Honley was called 'The Honley Book Club' and was started in 1750. It was the earliest subscription library in Huddersfield. - Members met once a month at 'The George and Dragon Inn' on Westgate, which was later converted into a Working Men's Club. Members met not only to obtain books, but also to discuss the literature of the time. - In 1800 the Book Club moved to 'Ye Wheat Sheaf Inn' on Southgate. Numbers dwindled and by 1823 only seven members remained and the Club was disbanded. - In the 1920s a free lending library was running in the Co-operative Society's premises on Concord Street; it was open on Friday evenings. - In 1935 the West Riding County Council bought the land for the present Library from Honley Urban District Council; the price was £250. This was in fact the site of the old Honley Workhouse which closed in 1876. - On Monday 9th March, Honley's new Library was opened. It was built by the West Riding County Council. A quarter of the cost and equipment and book stock was paid for by the Carnegie Trust. - The Library contained 2500 books, served a population of nearly 5000 and there were over 1000 registered readers in the district. - The Library was open to adults on four evenings a week and on two afternoons. Children could use the library on two evenings a week between six and seven o'clock. 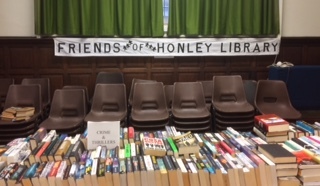 Friends of Honley Library would like to thank everyone who supported them at their Book Sale/Bric a Brac and Coffee Morning. It was a great success! There was a good selection of quality books and Bric a Brac which had all been donated. Refreshments were available and delicious home made cakes were available to buy. We raised a fantastic £392.10, so a huge thank you to the people of Honley and beyond for your continued support. Thanks also go to St Mary's Church for being so helpful and accommodating. 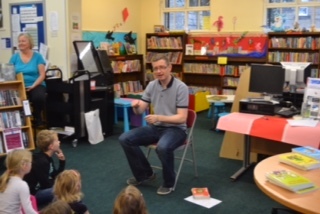 Children at Honley Library, aged between 3 and 8 years, had a wonderful workshop with Conrad Burdekin, a fun, unique and enthusiastic writer, storyteller and poet who inspires children up and down the country to want to write. 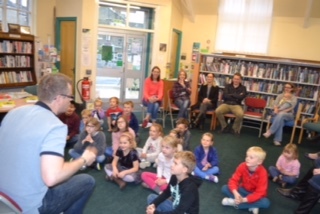 Conrad had the children and their adults spellbound from the outset with his interactive and engaging storytelling. 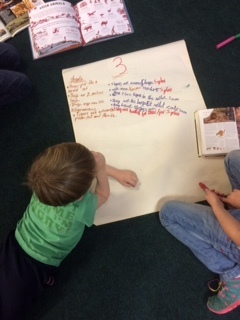 Conrad also read some poems from his books and then provided the children with a format for writing their very own poem on the theme of Halloween. The session finished with a number of the children reading out their poems. Everyone agreed it had been a fun filled morning and we have since heard anecdotes of children reciting poems and finding much fun in Conrad's books. We would highly recommend Conrad for anybody who is working with children and struggling to engage them with poetry. 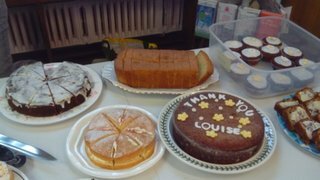 Friends of Honley Library hosted a Macmillan Coffee Morning. There was also a raffle and tombola as well as lots of delicious home made cakes. The morning was a great success and raised £178.28 for this very worthwhile cause. The 'Friends' would like to thank everyone who came along and supported them. 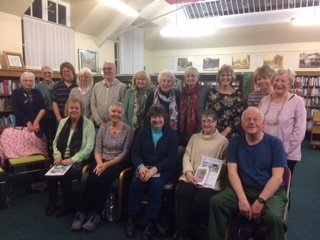 Friends of Honley Library hosted a fascinating local history talk by Carol Hardy entitled 'Kirklees Curiosities" followed by a question and answer session. Carol has lived in the Kirklees area all her life and has worked at Huddersfield Library for 16 years, mostly in Local History. 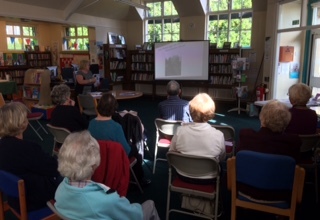 The talk featured lots of interesting facts and photographs about local odd and unusual items, architecture and shops - things we may pass each day without realising they are there. The audience agreed they would be walking with eyes wide open from now on! If you would like to find out more information, please visit the 'Kirklees Curiosities' website. 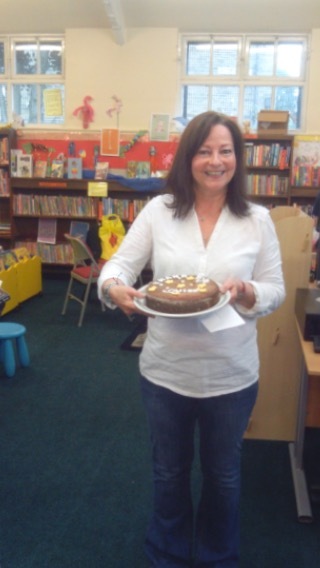 After 17 years at Honley Library we said goodbye to Louise as we wished her well in her new post at Holmfirth Library. Yes, there was cake!! Thank you Louise for all your help and kindness over the years. We will miss you! Meet the Author, Alan Gibbons - Cyberstein at Honley Library, Thursday 11th August, 10am-12 noon. In this fiction workshop, award-winning children's author Alan Gibbons led the children through an exciting fantasy story in which the young hero is fitted with the technology of a mobile phone and becomes the superhero Cyberstein. 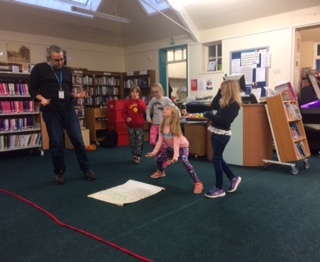 Alan demonstrated various techniques to develop writing skills to the children; after writing their story openings, the children got to design a Cyberstein movie poster using their artistic skills. Alan Gibbons has been writing children's and Young Adult fiction for 26years, with 37 publications. He is the winner of The Blue Peter Book Award 2000 'The book I couldn't put down' for his best-selling book 'Shadow of the Minotaur'. He has won 17 other awards. Before becoming an author Alan was a teacher for 16years. Alan is a full time writer and independent educational consultant. He is the organiser of the Campaign for the Book which promotes libraries and the culture of reading for pleasure. 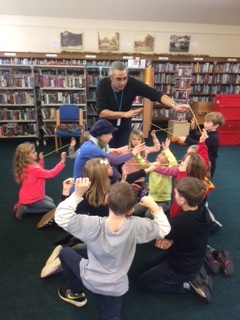 Alan visits 150-180 schools and libraries a year in the UK and abroad, working with young people to encourage their interest in reading and writing. 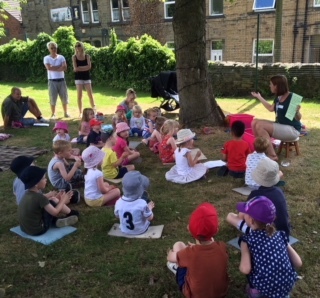 We had a wonderful afternoon in Honley Park, taking the library outdoors, the sun was shining too! 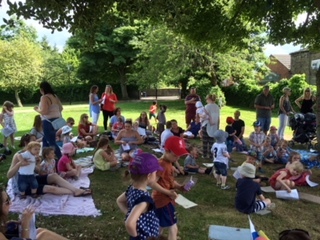 Children listened to 'Shark in the Park' by Nick Sharratt then had a fun time searching the park for characters from the book. Games and singing followed. Thank you to everyone who came and for making it such a special afternoon. Thank you also to Helen, Emily and Lou for organising such a great event! 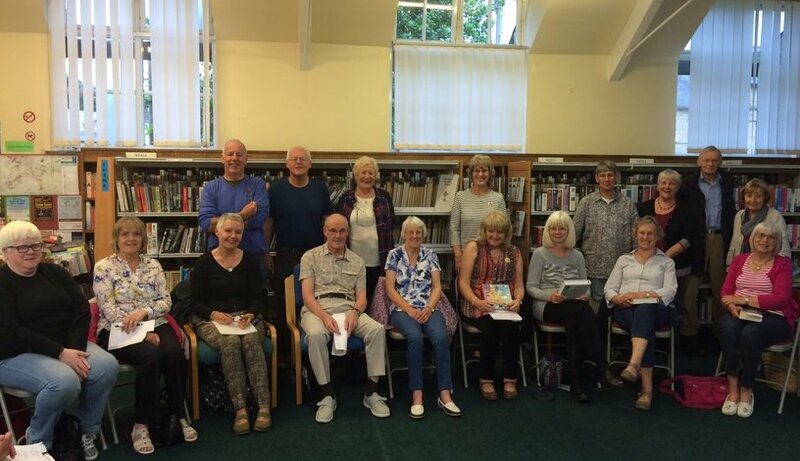 Friends of Honley Library hosted their Summer Poetry & Prose Readaround where 20 people attended. Guests read their own poignant, inspiring and funny poems, as well as some favourites. One guest read some recently discovered poems which had been written by her late grandfather and aunt, all of which were extremely moving. There was also a tribute to the late great Victoria Wood with an hilarious double act rendition of 'Let's Do It!' Thank you to everyone who attended and for making it such an enjoyable evening. Thanks go to Fish & Chicks and G6 Hair Salon of Honley for their kind donations for raffle prizes. 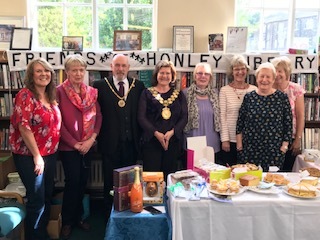 Friends of Honley Library hosted a charity coffee morning which included a book sale, raffle and bran tub for the children, as well as delicious home made cakes, some of which were diabetic friendly! The event was to raise money for the Mayor's Charity Appeal supporting Diabetes care in Kirklees. Nearly 25,000 people in Kirklees have some form of diabetes with an additional 1 in every 100 who don't know they have it. Lack of exercise and poor diets are the biggest contributing factors for type 2 diabetes, but its preventable in 95% of cases. The morning was a great success and raised £135. 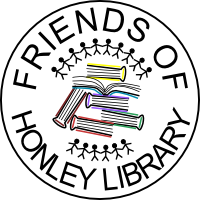 Friends of Honley Library would like to thank everyone who supported them. 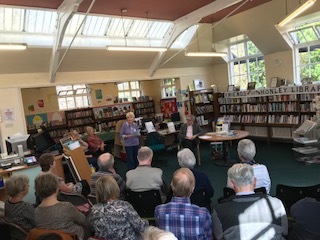 Friends of Honley Library hosted their Spring Poetry Readaround when over 20 guests read their own poems and favourites, all of which were extremely moving and thought provoking. Thanks go to everyone who attended. 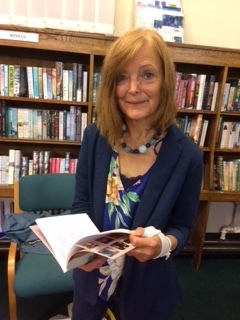 Anne Broadbent of Honley, also a member of Friends of Honley Library and Dorothy Foster's Holmfirth U3A Creative Writing Group, read 'The Smell of a Dog' which won the adult open poetry class in this year's Mrs Sunderland competition. 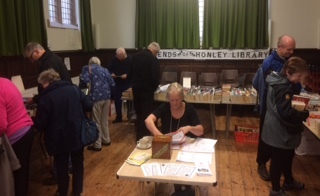 Friends of Honley Library would like to thank everyone who supported them at St Mary's Church Parish Rooms for their book sale and coffee morning. It was a great success. 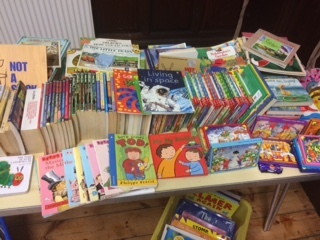 There was a wide range of good quality books which had been donated including non-fiction as well as popular modern fiction and some children's books. There was also a Bran Tub for the children. The 'Friends' were also giving out their new leaflets and bookmarks, as well as badges for the childlren. Refreshments were available all morning. Thanks also go to St Mary's Church for being so helpful and accommodating. 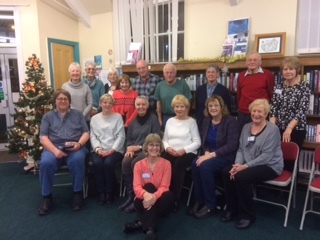 Friends of Honley Library hosted their Christmas Poetry Readaround on Tuesday 1 December. 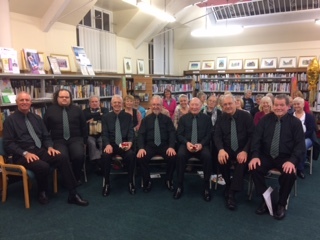 A packed Honley Library was treated to a special performance from '8 in a Bar' - a group formed from Honley Male Voice Choir, one of the top male voice choirs in Yorkshire who have had success both here and in America raising thousands of pounds for charities. If you enjoy singing, new members are welcome (see their website www.honleymvc.co.uk). Songs performed included 'I Believe', 'The Rose', 'Dream, Dream' and 'The Gambler', finishing with Christmas Carols. The 'Friends' presented '8 in a Bar' with a donation for Honley Male Voice Choir. Guests then enjoyed festive refreshments and were able to buy copies of the Honley Male Voice Choir CD - 'Voices in Harmony' which celebrates 80 years of Honley Male Voice Choir next year. The evening concluded with Christmas and Winter themed poetry and readings from the audience, as well as some favourites. Honley Male Voice Choir are appearing in concert with Carlton Main Frickley Colliery Brass Band at Huddersfield Town Hall, Saturday 12 December, 7.15pm. 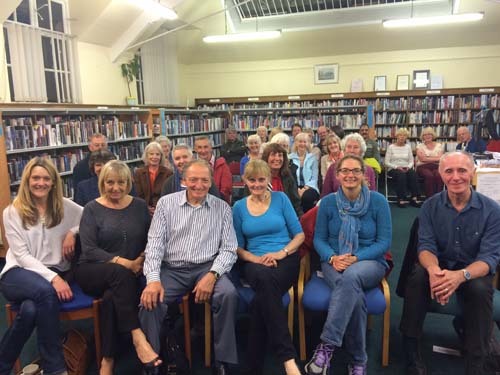 Friends of Honley Library hosted an evening with acclaimed prize-winning Huddersfield poet Julia Deakin. 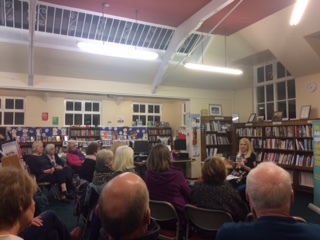 A packed Honley Library enjoyed listening to Julia read a varied selection of her poetry, including 'J'accuse', 'When I was Six', 'Codicil' and her newly penned 'It Has Rained'. She also held a questions and answers session and guests were able to buy signed copies of her collections. Julia was supporting the 'Shannon Trust Reading Plan - by prisoners for prisoners', a peer-mentored reading plan that gives prisoners a vital skill and a fresh start in life. (See www.shannontrust.org.uk for information on the work they do). The 'Friends' gave a donation to Julia for the charity. 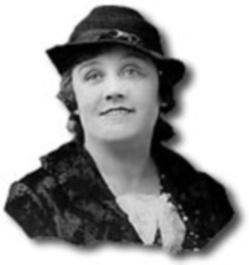 Julia was born in Nuneaton and worked her way north via the Potteries, Manchester and York to Huddersfield, where she began writing poems on a Poetry MA. Julia, a lecturer with a Masters' in Poetry, published her first collection 'Without a Dog' in 2008 - of which Simon Armitage described as "Crafted, tender poems, written with passion and purpose. An impressive debut." Other collections include 'Eleven Wonders'. Julia has won major competitions including the 2012 Lightship Poetry Prize, 2006 Northern Exposure Poetry Prize and was a 2007 Poetry Business Competition winner with 'The Half-Mile High Club' - of which Alison Brackenbury said "Bold, irreverent and wickedly funny". 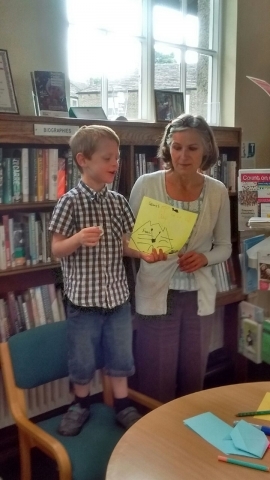 Friends of Honley Library hosted their Summer Poetry Readaround - 'Poetry Verses Prose'. The evening was well attended and guests read their own pieces of poetry and prose, as well as some favourites. There was a wide range of poetry and prose which were funny, sad and thought provoking. Guests also enjoyed refreshments along with the now famous 'Friends' delicious home-made cakes. 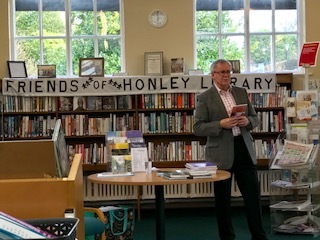 Peter Marshall, local historian from Honley Civic Society, gave an interesting and absorbing talk on the Formidable Women in Honley's History. Over 40 people attended the event and the audience were able to view digitalised old photographs which Mr Marshall brought along. There was also a question and answer session. Refreshments were enjoyed and Mr Marshall received a donation from the 'Friends' for Honley Civic Society. 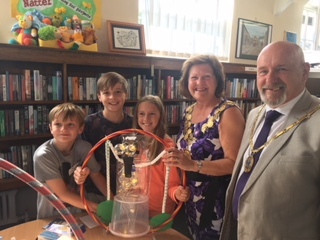 A special welcome was extended by Joe Hodgson, Chair of Friends of Honley Library, to Stephen and Alice Dufton, husband and daughter of Suzanne Dufton, previous Chair of the 'Friends' who sadly passed away just before Christmas. 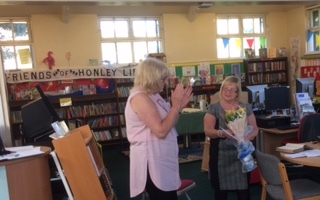 He gave thanks in appreciation of Suzanne's hard work for the library and said how much she was missed - also for her role in setting up Friends of Honley Library, for which she was awarded a Community Champion Award by Holme Valley Parish Council in April. 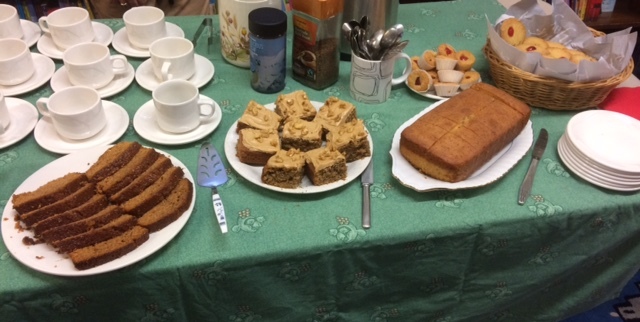 Friends of Honley Library hosted a coffee morning and raffle to fundraise for Kirkwood Hospice. The event also aimed to raise awareness of the specialist care they provide for people with life threatening illnesses, and the support they give to family, carers and friends. Lots of people attended the coffee morning. Visitors were able to buy Kirkwood Hospice gifts and enjoy refreshments along with delicious home-made cakes. A total of £155 was raised and the 'Friends' would like to thank all who attended.